"Friesian with a lot of bling!" Admire carriage driving Friesians? 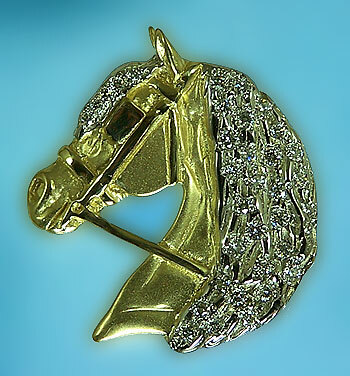 How about this beautiful Friesian driving head pendant complete with diamonds set in the forelock and mane. Having 35 matching diamonds is only the beginning with this Friesian we also applied a satin finish to bring out the excellent detail in the head and the rig work, rhodium plated the mane and forelock to help make this design stand out and alone from the rest! Friesian head pictured and set with .57ct of matching diamonds. Would look fabulous on any choker or nice chain.